Can’t see it? Click here to view it on SlideShare. I kind of do this. I don’t set aside specific days, but I write forward on my blog when I have the creative energy and then take breaks from blogging to work on my book projects. “Writing forward” is a great way to think about it. Congrats for hitting the two year mark, Dan! I noticed if I create a ‘set in stone’ schedule, and stick to it, this gives me the confidence to be consistent. Within weeks, you’ll integrate the schedule naturally within your blogging/writing approach and make that your second nature. Yes! Love this. I can definitely see how getting into a routine of intense writing sessions would be effective, and I definitely agree about creating outlines first. I recently started creating Google docs for large writing projects, and filling in the areas as ideas came to me, rather than focusing on writing beginning to end, and it’s been a much easier process! It’s really hard to keep your energy up when you try to write from beginning to end in one session, I find. Plus, breaking it up over a few days gives your mind more time to think about additional information you want to add, which is a bonus. LOVE the approach. It’s very much inline with the idea of “batching” or doing similar tasks together. I started applying that principal this summer (not to my writing yet but I will thank you!) and it’s done wonders for productivity. When we get into a particular mindset it’s much easier to stay focused and do quality work because you’re in the zone as opposed to jumping around between cognitively unrelated activities. Interesting that this has worked in other areas for you, Scott. I’m betting you’re like me … you spend a lot of time jumping between “cognitively unrelated activities” (aka, jobs that use different parts of your brain). Batching similar tasks together makes you work more efficiently: I know it works for me. Sounds like you’re still figuring out what schedule works for you. Good luck! This was timely, as I have been disgruntled about my yield! So thanks! Also, regular feedback from readers that my work is helpful really goes a long way to keeping me motivated. Wow! I would have never thought of planning my work quite like this and in so much detail. Thank you kindly for sharing! I will definitely use your post to improve my writing. Thanks Pamela! You say to email influential bloggers and ask them to link to our post. Do you think this is the right way to do it, I mean, do you recommend we specifically ask for a link in return or just let them decide for themselves? The best approach is “I think this article would be of use to your audience” and leave it at that. Don’t specifically ask for a link, frame it in terms of benefit to their audience, which means it’s a benefit to them. To add to that, I have my marketing schedule set pretty far in advance. If I’m sent something useful that I’d like to share, it’s easier to do so if there’s some flexibility about exactly where it’s shared. 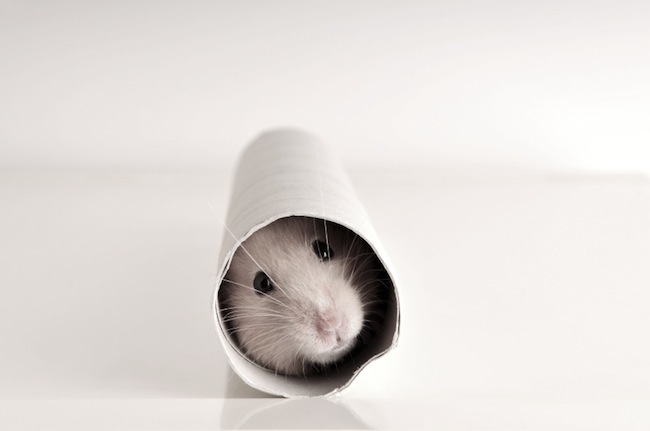 “Hamster wheel” – I guess you are speaking figuratively. If the hamster wheel is all in your mind, as it is in this case, I guess it depends on whether you get to write or you have to write, whether you love your career choice or you hate it. “Hamster wheel” – I guess you are speaking figuratively. I’ve been writing professionally for more than 20 years, and your system would drive me absolutely bonkers . :) But, I’m happy it works for you and I can see how it might work for others. The key takeaway from your post is to find a method that plays to your strengths. And keeps writing fun. Because, if you don’t enjoy the process (whatever one you create), you’ll stop writing. I don’t write everything this way. When I look ahead and see a big writing project, or know I’m going to have a busy month, I’ll use this method to crank out a bunch of pieces all at once. Enjoying the process is key. This weird little system is actually enjoyable for me! I use a version of this plan. I post 3 to 5 times a week and usually have about 3 to 4 weeks scheduled ahead of time. I usually write a couple posts during the week. I tend to block write on Saturdays and take Sundays off from writing. Thanks for sharing. Great post, this is a wonderful way to keep your writing fresh. Thanks for sharing! I need to start doing this. I think I would not know what to do with myself if I actually sat down and wrote out a months worth of posts that could really help me with Procrastination. This sounds really great and I can’t wait to give it a shot. This is definitely appealing to me! My binge would need to be spread over a couple of weeks to work around my schedule -but to keep the momentum up, not lose the thread or the ‘voice’ would be great. A novelist friend goes on writers’ retreats occasionally. Imagine it. Country walks, cooked meals and solitary writing. A fabulously indulgent and productive binge. How good would that be?! Thanks for the inspiration Pamela. It’s definitely a flexible technique, Jacqueline, so spreading it over several weeks should work fine. Great post, Pamela. More and more lately I’m finding myself binge writing out of *necessity*, basically for all the reasons that Scott Ellis so eloquently outlined in his comment above. We all have to wear many different hats that require different skill sets and different mindsets. And I’ve found that my efforts get diluted if I try to work on too many tasks simultaneously. Better to get “in the zone” and do that one thing really well, then move on to the next. I chuckled at your call waiting comment, Mark. I removed that years ago, and have had people email me, frantic to let me know that my “phone line was down” because they got a busy signal when they called. One thing at a time! Those little interruptions really chip away at your productivity. I love your approach here Pamela! Lately, I’ve been writing 3 posts all on a Monday, then scheduling them for the rest of the week. It’s been more productive for me, but I like the idea of writing a month of posts in a few days, that would work even better! Sometimes getting away from the keyboard is great too – I go down to a river or close to the beach and write in my notebook. My thoughts flow better when I’m in my favorite environment, and I leave the phone home! Hand writing is slower but my thoughts flow better, so it’s faster in the long run. I had jury duty a few weeks ago, and got three posts written while I waited to see if they called my name. All I had was a pad of paper and a pencil, but because of that I ended up sketching out ideas for graphics, too. 4. It is the opposite end of spectrum when it comes to thought leading content – which is informed, thoughtful, novel content. I call it content on steroids because of the significant impact it can have on the target audience. Its binge writing which has led us — Dr Liz Alexander and I at Leading Thought to start something called ‘The Slow Content’ movement. Quite the opposite to binge writing, slow content is clever, thoughtful, insightful writing. Writing that is well researched. Writing that is client centric preferably on issues and challenges they face. Writing that adds a novel point of view. Writing that forces people out of their mental myopia and makes them think differently or better still changes their behaviour. In our drive for SEO, shareability, greater share of voice, etc, we have lost sight of why we write in the first place which is to influence a market. When binge writing turns off the very audience we are trying to reach only then will the massively clogged arteries of information out there start being cleansed by more informed, better written and more thoughtful pieces. Until then we will continue to groan under the weight of fast content on the web and other social media sites. Craig, I think I know where you’re coming from, and in general I’m very sympathetic to it — for me, though, this one was more about batching the tasks that go into thoughtful writing. The kind of junk-food content that I see around the web (and heartily dislike) isn’t edited, isn’t researched — it’s just extruded for pennies a word. Content produced by the method Pamela is talking about is more like how books are written — in larger, more cohesive chunks. That’s how I see it, you may see it differently. Sonia if that’s what she meant then great but I’m not so sure. To me it is more about churning out lots of content. And that’s the problem. The post is about writing thoughtful content efficiently. The quality of the content depends on the writer, of course, but I believe encouraging authors to spread out their writing over several days — with specific times devoted to planning, writing and editing — will result in overall better content than someone who tries to churn it all out in one sitting. Pamela and you’ve done that superbly, however, one cannot escape the fact that the premise of this is, as you say:”successful content marketing involves creating a lot of content, and keeping it up over a period of weeks, months, and years.” And that’s precisely my issue – the pressure to do this consistently can only mean that quality and the creative process will suffer in the end. One only need look at the amount of drivel around to realise we are right in the midst of it already. It’s the content fast food conundrum. We’ve been doing it here consistently for almost 8 years. You are the judge of the quality, of course, but I think we do pretty well. I’ve been following Pamela and Copyblogger for years and have never felt like they were pushing out junk content just for the sake of pushing out content. It’s always relevant, timely and well written. I agree that there’s a lot of crap being written out there. But I can always click the ‘Unsubscribe’ link if I don’t like their content. In my opinion, Pamela and Copyblogger put out a great product. I want to learn from people like them and am happy to spend my money on their products. Brian you have indeed but you have been clever about it with the number of bloggers you have submitting fresh, well constructed copy. My grip is there are way too many brands out there not doing this. They are more interested in binging on content than producing the well-planned content you guys produce. off topic: i’m wondering where you got the image of the hamster? i’m looking for such a picture for a long time and the google image search didn’t help me out. I love a good writing post filled with practical tips – well done, thank you. Great tips! Thank you. I just love Copy Blogger posts. One thing; I disagree on the efforts to make your voice the same in every post. I think that might get a little boring actually. Just my opinion. Sometimes I’m angry, sad or feeling sarcastic or humorous. These emotions don’t really change my voice but my tone will be different. Angry, sad, sarcastic, or humorous are inflections of your voice. But you still sound like you in each of those modes. That’s what voice means. Yes, good point. Thanks Brian. That’s my positive inflection.